The showers yesterday and the wind overnight haven't made any real dent on the flowers. While you can find a smattering of petals that have been blown off onto the ground, it's only a minuscule amount compared to the whole and has had no effect whatsoever on how beautiful the spectacle is. You can't tell from looking at the trees even close up that any petals are missing. It was quite busy for sunrise, but not long after that the crowds thinned out as people headed off to work. Cool, breezy, and clear. Quite busy for sunrise, but the crowds quickly thinned out as people headed off to work/school. Here are some photos to give you a sense of how it's looking today. Quite a few people out for sunrise. This was the stretch down by the southern end of the FDR Memorial, directly across from the Jefferson Memorial. Obviously, not everyone can go during the work week, so I've been getting a lot of questions about the weekend of April 6-7. The odds are good that there will still be plenty of flowers out and they'll be looking lovely. But it's never a sure thing because so much of it depends on the weather. So far, the forecast is looking quite good. In ideal conditions (cool, calm, dry), they can last more than a week--perhaps even two. 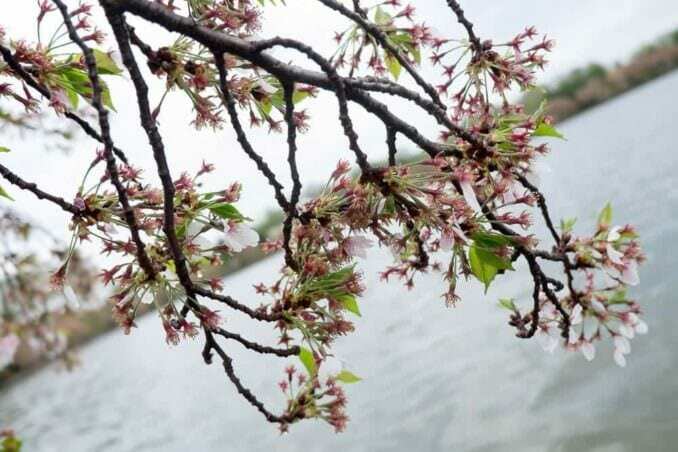 But as they move past full bloom the flowers also become more fragile, which makes them more vulnerable to rain, wind, and storms, and it's not unheard of for them to be mostly gone in 4-6 days after the peak bloom day. For more detailed examples, I've put together this photo timeline from past years showing the types of things you can expect in the days before and after peak bloom. So there's a good chance they'll still be looking lovely the weekend of April 6-7, but as you can see from these photos, it's impossible to give a firm prediction, and it's worth going into it at least knowing of the risk that unhelpful weather can potentially have an impact. One extra consideration for April 7 is that the Cherry Blossom 10-miler is being run that morning. You can still get to the Tidal Basin, but it makes the logistics of getting to and from more complicated because of the road closures that come with it. It's past its prime now, and some of the petals came off in yesterday's showers and breeze. No Drone Zone. If you're planning to use a drone . . . don't. The Tidal Basin, and the whole downtown DC area, is strictly a no-drone zone. Here's a more detailed explanation. Thanks for all the posts. This website was invaluable to helping me plan for our trip. My wife, mother-in-law and I were able to go on Monday and it was wonderful. It's interesting comparing my shots to yours. Completely different. Great shots, I'm a bit jealous I didn't see similar angles to you in some of them. My family and I have been planning on coming out from Denver, CO this coming Friday April 5th in the hope that we will still get to see the blooms the next day. However, we're a little concerned about the weather forecast for Friday - pretty much rain all day. I know it's tough to say, but is that likely to wipe them out? Thanks. Rain certainly isn't helpful, but how much trouble it causes depends on how heavy the rain is and how strong the winds are that follow it. So it's just impossible to say this far out. 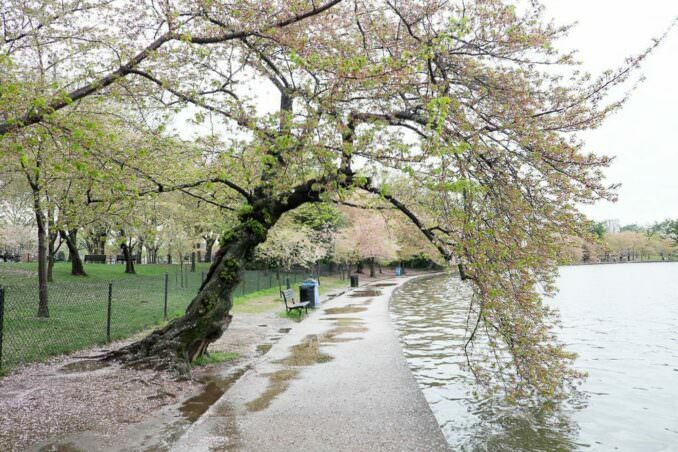 The NPS has just said that the weather forecast suggests that you can expect to see blossoms for the next 7 to 10 days. Looks great! Have they technically reached the peak bloom phase yet? NPS hasn't announced it, but I'd expect it anytime now.